A vegetarian twist to traditional punjabi favourite – the fish amritsari. You can avoid food colour in this recipe if you wish. 1.Combine the paneer strips with the prepared marinade and toss gently till the marinate coats the paneer strips evenly from all sides. Keep aside for 15 minutes. 2.Sprinkle besan on the marinated paneer strips and mix gently so that the besan coats the paneer evenly from all sides. 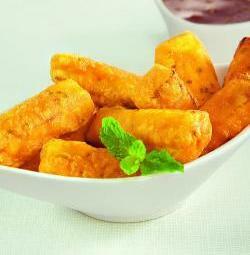 3.Heat the oil in a kadhai on a medium flame and deep-fry the paneer pieces till golden brown. Drain on absorbent paper. 4.Serve hot sprinkled with chaat masala.